I would very much like to visit The Semjase Silver Star Center. I am a Pleiadain and I have seen some Beamships but at this time I have not taken any trips with them. If the Pleiades are not suitable for sustaining human life, how can you be Pleiadian? The stars we see from planet earth which are designated as the Pleiades are incapable of supporting human life at this time. When you make statements as you have made, expect to be questioned by others to back up what you say. How long have you been studying Billy Meier? Am planning on visiting the SSSC in May. Would like to become a member well, passive member before that time. Have been writing Phillia Stauber asking how much I should send for that membership. Gave her my monthly pay and my question was: Is this before taxes or after this one seventh of my monthly pay? I do not want my implants removed! Hi Someguy, mind if I ask what you mean by "I do not want my implants removed!" I think that myself from the future implanted me to keep track of me, and if I pointed them out to a doctor, most likely they would want me to remove them and it is a reminder not to do it. Someguy, you have to know that Billy admits time traveling as a possibility and as a real reality, but a time traveler from the future cannot alter/modify the past.He can just sit and enjoy the movie. (passive spectator, but NEVER active creator). Now SG , that could be a fanciful theory , although this is just a practical one . It could be a humorous moniker that is used by your present self to keep things light , even if it sounds good as an advertising phrase for breast implants ; and I mean no humor by that . Hector, I appreciate your responses but you dont know and simply cannot answer a question meant for someone else, what has been written is not written in stone and you do not know the rules of time travel, your border line implying that I am delusional which is not for you to judge, if that is your opinion fine, but come across that way, let go of your ego and dont believe everything you read, everything happens for a reason. mark, I am not sure what you mean. Please lets get back to the topic heading. I have a simple question relating to �Semjase Silver Star Centre�. I can understand the �Semjase� and �Centre� part but why was �Silver Star� also added into the title; does it have a significant meaning for Mr. Meier and or FIGU? Sorry just curious. It's really just a name .The ships look like stars in the sky when theyre high above . It's just kind of catchy . So did Crowley's (OBVIOUS!) puppetmasters the Bafath anticipate the Swiss initiative, of is it just a nice name?? 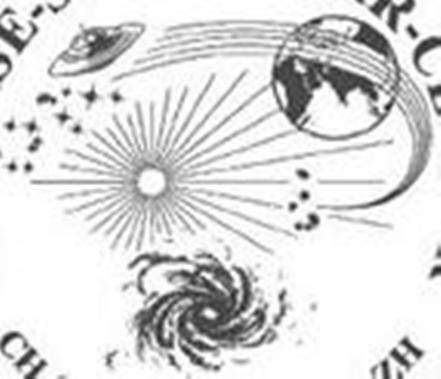 Now I'll ask my question again about the image of the galaxy on the FIGU logo ... where did it come from? Thanks Mark for the reply, I understand now. 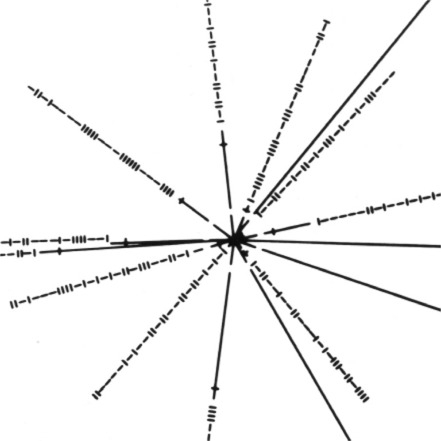 There are astronomical references (naturally) here in the symbols for the �Semjase Silver Star Centre� and I have a few questions about this, but these questions are for another time and place. If I am ever afforded an opportunity to visit the centre then perhaps some of the good folk there may be kind enough to answer them along with much more important questions. Actually I don't know who was drawing the FIGU logo some 30 years ago. But I will ask for it and will let you know. What I can say is that there certainly is no connetction with Aleister Crowley or the Bafaths. What you can see on the shield is the solar system planets, and on the logo you see the ship flying away from the seven-star Pleiades, then the milky way galaxy (where we are living in) and the central sun. That is my opinion. But I will verify my opinion with the person who made the logo. I must retract the second part of my previous post, I may never in fact get to visit the �Semjase Silver Star Centre� to ask my questions therefore I would like to offer some comments and ask one or two questions. Sorry I don�t mean to be hanging onto small details, but Dyson did ask a pertinent question relating to the symbol of the �Galaxy� which could turn out to be more important than one realises. First of all we are not 100% sure of the actual structure of the MilkyWay galaxy, we can only infer by observation and measurement with current technology. We have good scientific reasons to think it may resemble in structure that of the Andromeda galaxy, in other words a true classification of a spiral galaxy, as is depicted on the logo. The person that thought of using the symbol of the MilkyWay galaxy either knows this structure to be 100% correct because they were outside of the MilkyWay galaxy and observed it directly, or received insights/information without knowing from a knowledgeable source, or was it just plain doodling? Secondly, you may notice that on the shield logo and on the circular logo there is a representation of a Plejaren spacecraft with five wavy lines emanating from the craft, would this be hidden clues to its propulsion system or is it just an innocent design? Thirdly, on the shield logo, there is what appears to be a representation of a solar system. Is this our solar system of the Plejaren system? The reason I ask is that the fourth planet from the star appears to have a binary planetary system. Mars is a singular planet in our system and fourth from the Sun? There are a few other questions but I will leave it at that for the moment. I'm excited about learning more about that galaxy, because the contact notes say that we are in an enclave outside the outer edge, and those are depicted in this illustration. IMAGINE how exciting it would prove to be if it were a MAP!! It is very interesting that you mention a map and our location within the MilkyWay galaxy. I like to share the following insights in relation to this and the logos used by FIGU. It is my assumption that many people when first visiting the �Semjase Silver Star Centre� do not perhaps pay close attention to the logos (I may be wrong). It is my �Gut feeling� for want of better words that there was a lot of thought ploughed into designing these logos that FIGU use. Perhaps this is �analysis paralysis� as the saying goes, but ideas are brought forward to discuss in a logical manner hopefully. Therefore I would like to offer some views and if other people on the forum had similar ideas, hopefully they could share with others here. In addition, on the circular FIGU logo there is a two dimensional representation of a star with radial lines emanating from it. There are 36 lines in a radial pattern of varying lengths. You may also notice a long horizontal line (taken as one line) on this logo. My thoughts for what they are worth is the following. If one looks at pictures of the plaques used on the Pioneer and Voyager space probes launched from Earth one will notice a similar design. 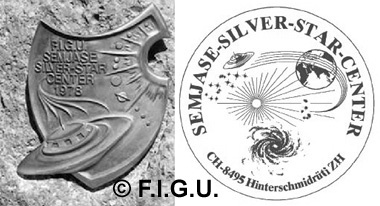 The Pioneer & Voyager plaque design represents a map of nearby �pulsars� (a rotating star capable of emitting precise regular radio pulses, each one so far discover is unique, like a fingerprint in space), with the sun at its centre. The longest line represents the �Galactic Plane� (The plane in which the disk of the MilkyWay contains most of the material, i.e. stars, interstellar material etc.) of the MilkyWay Galaxy. In fact this is a map which when deciphered can lead an intelligent species to our solar system in relation to its relative location in the MilkyWay galaxy, (as they say in legal terms, �this map is subject to change without notice� and will do so over millions of years as the MilkyWay galaxy and all matter therein is a dynamic rotating and moving mass). Is the symbol used on the FIGU logo meaningful in this sense, or is it just a simple representation of the Sun or the central star of the Plejares (have I got that spelling right?) system? Sometimes simple answers are closer to the truth than far-sought ones. The draft for the FIGU logo was created by Billy. It was Hans Schutzbach who made the drawing, which later was improved by Bernadette Brand. The beamship is flying from the Pleiades to other (non-specific) stars. The galaxy is the milkyway. The sun is our sun SOL. The name "Semjase Silver Star Center" was created by Billy in memory/honour of Semjase, the first contact person from the start of the on-going Mission period. Silver Star = Silberstern is a fantasy name/expression, with no other hidden meaning except that stars are shining like silver on the night sky. I guess that this answers all questions. "The name "Semjase Silver Star Center" was created by Billy in memory/honour of Semjase, the first contact person from the start of the on-going Mission period. Silver Star = Silberstern is a fantasy name/expression, with no other hidden meaning except that stars are shining like silver on the night sky." 100. Das aber wird dir ein Ansporn für weitere harte Lehren sein, die du durchzustehen und zu bew�ltigen haben wirst, durch die du dich jedoch bef�higen wirst, zusammen mit sich um dich scharende jenen Sitz aufzubauen, den du Semjase-Silver-Star-Center nennen wirst und von wo aus du mit Hilfe jener, welche zu dir stehen werden, deine Mission weltweit starten und verbreiten wirst. 100. That will, however, be an incentive for you for further hard lessons that you will have to withstand and overcome, through which you will, however, be enabled to construct that place, together with those who gather around you, which you will name the Semjase Silver Star Center, and from where you, with help from those who will stand by you, will start, and spread, your mission worldwide. So, was this name chosen in advance or did Billy forget what Sfath told him at that time? Also, does this mean that any future daughter Center already has a predetermined name? Looks to me like Sfath was just simply telling him what he will eventually name the center. I guess Billy is as human as we are, to some degree that is and I remember reading from Dyson's many translations whereby Billy when speaking to Ptaah is asking him if he (Billy) is correct remembering certain events/things that he was told long ago. Also what did you mean by "future daughter Centre"? do you have some information about such possibilities? Maybe Australia is it?